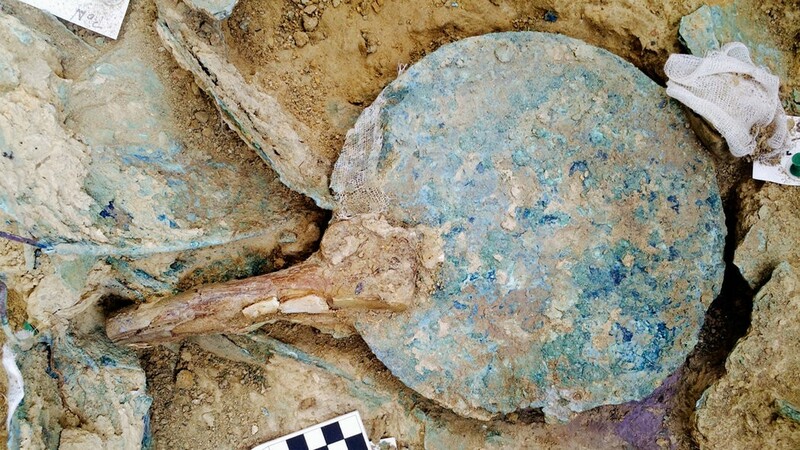 Archeologists at Pylos, on the southwest coast of Greece, uncovered a rich grave of a warrior buried there at the dawn of Europen civilization at around 1,500 BC. The warrior lies in the grave with a yardlong bronze sword and a collection of precious jewels, such as gold rings, as well as carved seals. 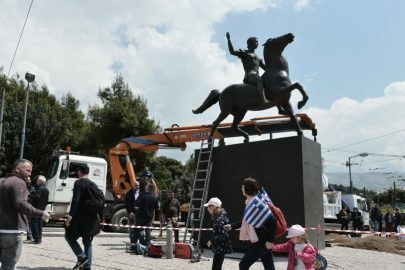 The discovery has astonished archeologists who believe that the grave could potentially shed light on the emergency of the Myceneaen civilization, opening the door to learning more about potential Homeric heroes such as Agamemnon, Odysseus and others. In fact, the palace of Nestor arose next to the site, becoming a large administrative center that was destroyed in 1180BC, about the same time as Homer’s Troy. The palace was part of the Mycenaean civlization from where classical Greek culture was developed hundreds of years later. The grave is at ground level and seemed easy to find but people were unaware of it for 35 centuries. 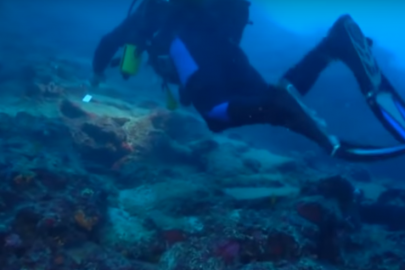 It was first discovered on May 18 by Jack Davis and Sharon Stocker, a husband-and-wife team from the University of Cincinnati, that had been excavating at Pylos for 25 years. Davis could not believe that they were the first. “I’m still shaking my head in disbelief. So many walked over it so many times, including my own team,” he said. The team began to excavate outside the palace in the hope of understanding how ordinary citizens lived. Davis was at first pessimistic when finding the grave thinking it to be a medieval construction, as if it were prehistoric it would have been robbed. Remarkably, however, it was a very rare shaft grave – five feet deep, four feet wide and eight feet long. The burial was intact, but a one-ton stone that may have been the lid had fallen in and crushed the wooden coffin that has long since decayed. The grave’s owner was around 30-35 years of age and was buried lying on his back. Placed to his left were weapons, including the bronze sword with an ivory hilt cld in gold and a gold dagger. On his right are four rings with fine Minoan carvings, 50 Minoan seal stones with imagery of goddesses and bull jumpers with high quality engravings. An ivory plaque carved with a mythical griffin lay between the warrior’s legs and there were also gold, silver and gold cups in the grave. Beside the warrior was a bronze mirror with an ivory handle and six ivory combs. 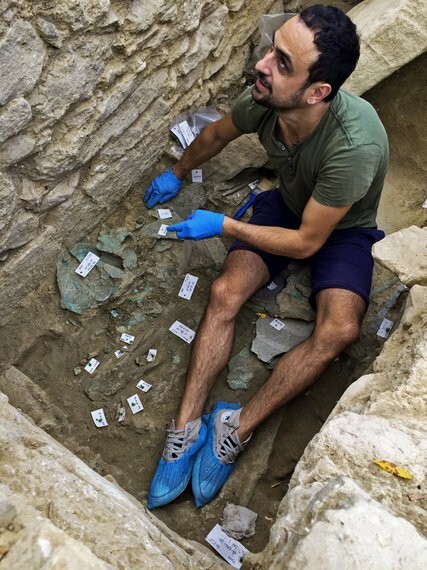 Thomas Brogan, director of the Aegean Prehistory Study Center Institute for East Crete, describes the tomb as a “real highlight” of his career, stating that you can count tombs as wealthy as the one found at Pylos on just one hand. 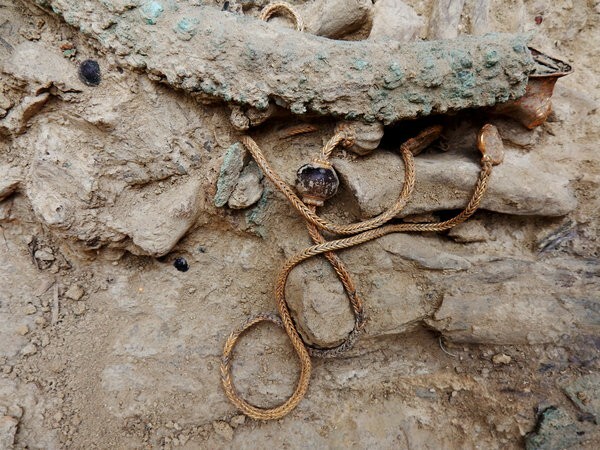 “Probably not since the 1950s have we found such a rich tomb,” says James Wright, director of the American School of Classical Studies at Athens. 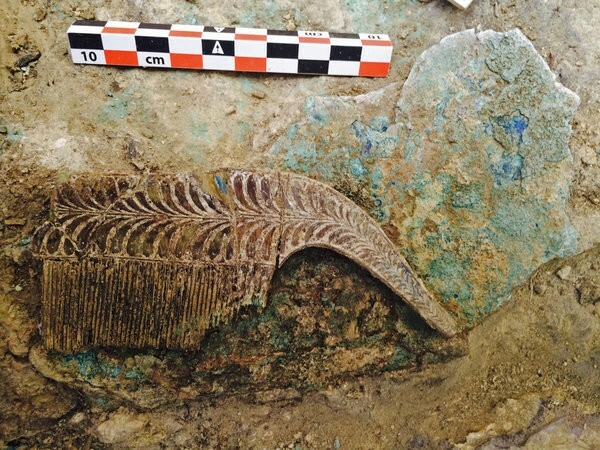 The archeologists hope that the warrior’s grave may hold the answer as to how Minoan culture passed to the Myceneaens. After all, the grave is full of Cretan artifcts. “This is a transformative moment in the Bronze Age,” says Dr. Brogan. 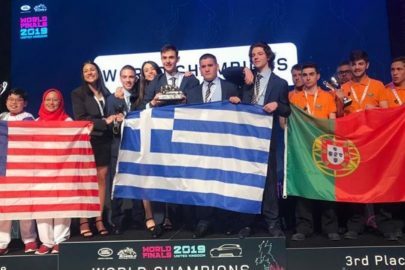 On his part, Dr. Wright states that the date of the grave is “at the heart of the relationship of the mainland culture to the higher culture of Crete” so that scholars can begin to understand how the two cultures morphed together. The archeologists are calling the occupant of the grave the “griffin warrior” due to the griffin plaque. Ancient Greek graves can be dated by their pottery, but the griffin warrior’s grave had none. Davis, however, believes it was dug in the period known as Late Helladic around 1600 BC to 1400 BC. Archeologists are interested in the fact that the grave objects are culturally Minoan but the place of burial is Myceneaen and it is unknown if the grave objects were significant in his culture or plundered. “This is a critical period when religious ideas were being transfered from Crete to the mainland,” said Davis. Archeologists will now proceed to study the unlooted tomb using modern techniques like DNA analysis that may shed light on the warrior’s origin. DNA may show where he was bornand could yield a radiocarbon date for the burial. The techniques will allow far more information to be extracted than was possible with techniques by earlier excavators.